Two art students/designers, Michael English and Nigel Weymouth, whose striking graphics were seen on many posters during the sixties, were the creative talent behind this band along with DJ and manager Guy Stevens. Their first album is something of an electric mayhem and freeform freakout which has not stood the test of time well. With the record completed, Weymouth and English continued to work as designers, while Stevens was by now a producer at Island Records with Art (later to become Spooky Tooth) among his credits. Nigel Weymouth retained the name Hapshash And The Coloured Coat for a second, less radical album on which he was joined by line-up B and received session assistance from Tony McPhee (of Groundhogs) and his early producer, Mike Batt. Mickey Finn, later of Tyrannosaurus Rex, was also a member at some point, but the group disintegrated late in 1969. Ken Kesey played bass on their 1969 45. This album has acquired a bit of status as a minor legend over the moons, and it's not too hard on balance to hear why; besides the grandiose spirit-of-1967 group and album name, this brief but interesting record has a lot of descendants, though whether that was intentionally the case or not is up in the air. 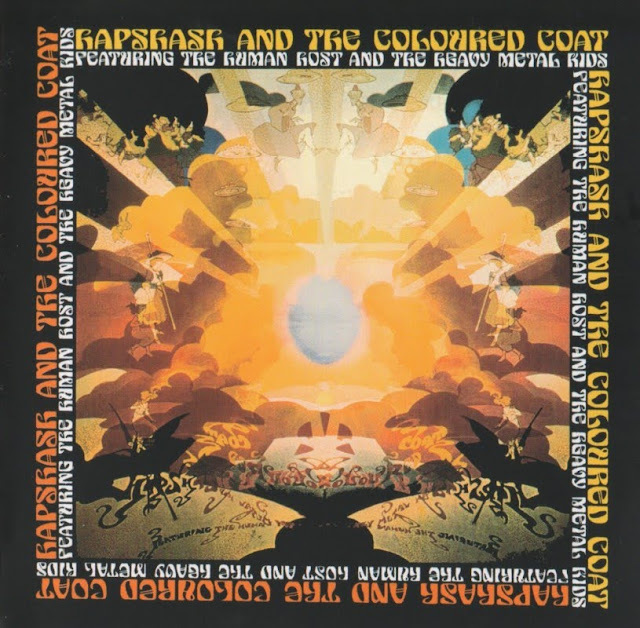 The English trio that made up Hapshash & the Coloured Coat for its original incarnation was composed of art designers and DJs by trade; this, their sole release together, is a classic situation of lightning in a bottle. The emphasis is on blunt but entrancing rhythm throughout — pounding drums and bongos, rolling piano (sometimes practically barrelhouse), and chunky guitar parts that are proto-funk as much as steady, straightforward crunch. Combine that with vocals that appear then disappear as needed and an air of ragged partying, and it's not too off balance to consider this album as a fine equivalent to what the Velvet Underground were starting to cook up. Certainly it sounds like the original Amon Düül had this spinning when creating their own freak-outs a couple of years later, what with the chanting and fractured acid folk guitar here and there ("The New Messiah Coming 1985" is particularly gone). Even the shorter songs, like "A Mind Blown Is a Mind Shown" and the mostly a cappella chanting of "Aoum," sound like excerpts from much longer efforts. "H-O-P-P-Why?" kicks everything off with the right blend of things, but it's the monstrous, bell-laden "Empires of the Sun" that's the winner, with some great parts where the (at points elsewhere, orgasmic) vocalists sound like mariachi singers. Credit as well to member Guy Stevens' excellent production, which is much more lively and detailed than many recordings of the time; he went on to work as a house producer for Island Records, and it's easily clear why.